You have probably heard about the Italian Teacher and his summer activity list. When I saw the story about Mr. Cesare Cata's Summer homework list I had several thoughts. The first was we didn't even use the term "going viral" in a non-medical way even 5 years ago! Have you ever stopped to think how many everyday terms we use today that involve some type of technology that we didn’t use five or ten years ago? We google, Facebook, "pin," "tweet," etc now ... when did nouns start becoming verbs? The second thought I had was this list is a testimony to teaching being an art. These 15 items highlight the very beauty of being a human being and at the same time weave in the learning that had taken place during the school year. Mr. Cata has painted a beautiful tapestry of learning, character, and thought. Reminds me of our history lessons on the Renaissance Man! And finally I had a thought of hope. Several of the comments from people all over the world reflected on the desire to study under a teacher like Mr. Cata. There was that recognition that a great teacher brings learning and joy to his/her students. We can all hope to produce more and more great teachers so all students can experience that joy! Take a few minutes and read out Mr. Cata's summer list — this is a to do list we could all benefit from accomplishing! Speaking of accomplishing your "to do" list ... I hope you have checked off two items from your June To Do list: 1. Submitted a nominee for the G Award and 2. Registered for the CASE/CEC Legislative Summit! Today is the last day to submit the nominations for the G Award! The G Award is in only it's second year and is designed to give special kudos to a "new" special education administrator. Take a few minutes to nominate someone in their first three years of leadership who has done an exceptional job of supporting the teachers and students they serve — someone who leads with their heart! Click here to go to the nomination form! The second item on your to do list is registering for the Summer Legislative Summit. We need to "tell the story" of all the amazing things our staff and students have accomplished this year to those up on the Hill. As the tag line says, "What happens in the classroom shouldn't stay in the classroom. Send the good news from your district to Capitol Hill." We need a team from EVERY state in order to really make a statement! As you enter into your Senator or Representative's office, think what kind of impression you will make when you can say there are teams visiting their Senator's and Representative's offices from all 50 states! Be a leader and not only make sure you are a part of this great event, but make sure you are a part of a TEAM to make an even bigger impact on your state delegation! Go to the CASE website or straight to the Summit website for more information and to register now! 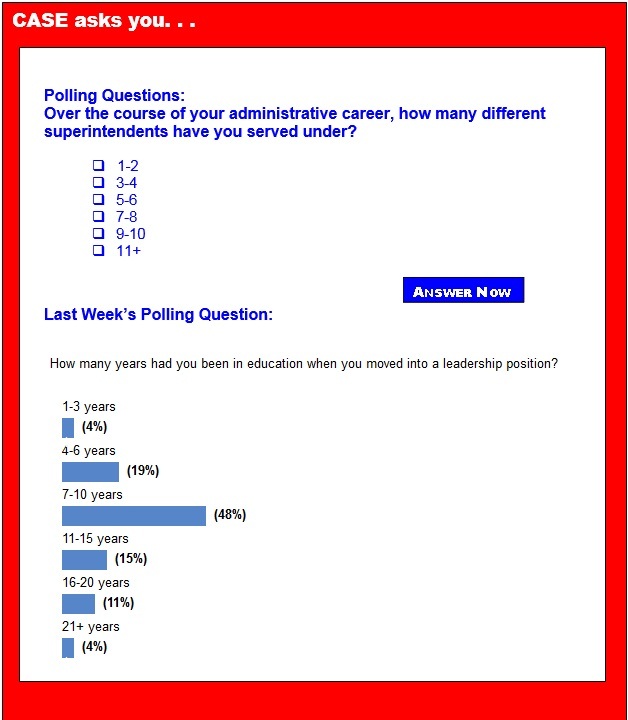 Last Week's Poll asked How many years had you been in education when you moved into a leadership position?” Of those answering this week's poll, 48 percent had been in education 7-10 years when they entered into the leadership field. Nineteen percent entered after 4-6 years followed closely by 15 percent entering after 11-15 years. Eleven percent entered leadership after 16-20 years. There was a tie at 4 percent for those who had less than 3 years experience or 21 or more years! Thank you to all of you who answered the poll this week. It is very helpful to our leaders to hear from our members! Do you have ideas for the polling question? Post them on our CASE Facebook page or email them to me! Recently, the Senate confirmed Michael Yudin to serve as Assistant Secretary for Special Education and Rehabilitative Services at the U.S. Department of Education. Arne Duncan in his announcement of Yudin's confirmation said, "Michael has dedicated his career to advocating for all students to have access to and receive a quality education. The Secretary has published a list of correspondence from the U.S. Department of Education to individuals during the previous quarter. The correspondence describes the Department's interpretations of the Individuals with Disabilities Education Act or the regulations that implement the IDEA. This year marks the 25th anniversary of the Americans with Disabilities Act, a time to celebrate the successes of its passing while also remembering that full inclusion and equal opportunity are still not a reality for many individuals with disabilities. The Act would not have been passed had it not been for those individuals who advocated so strongly on its behalf. Only a handful of states that cut education money during the recession have increased it since the economic recovery, according to a report about how public schools are funded. It also found that most states don't funnel extra education dollars to public schools with high concentrations of poverty. "The nation as a whole, this report shows, is failing to provide the resources our students need," said David Sciarra, executive director of the Education Law Center, an advocacy group for equal educational opportunity that produced the report. It covers the nation's 49 million K-12 students in public schools. Before the law that governs special education was enacted 40 years ago, youths with disabilities were often marginalized. Only about 1 in 5 children with disabilities was enrolled in public schools in 1970, according to the U.S. Department of Education. The legislation that later came to be known as the Individuals with Disabilities Education Act made a dramatic difference. Students with disabilities now have the right to be educated in public schools with their nondisabled peers and to be prepared for a positive and productive life after school. A new report finds that students with disabilities are faring far worse on standardized tests than their typically-developing peers. Scores for kids with disabilities ranged from 32 to 41 percentage points below those for other students on state assessments during the 2012-2013 school year, according to findings from the National Center on Educational Outcomes at the University of Minnesota. For the report, researchers combed websites for all 50 states, the District of Columbia and 10 other areas including Puerto Rico and the U.S. Virgin Islands. Health-care professionals, educators and patient advocates debate endlessly over attention deficit disorder. Some argue about the cause of the condition, which is associated with inattentiveness and, often, hyperactivity. Many disagree on treatment and parenting techniques. A dwindling group disputes whether it actually exists. Systems and structure don't come naturally to your child with ADHD. And if you have ADD, too, you know that it takes a lot of work to keep track of all life's details. To ease the burden, here are helpful strategies for creating structure in your home so each day doesn't feel like a whole new scattered experience. Rachel Jones, a contributor for SchoolWeek, writes: "Tasks such as writing and alphabetizing can be time-consuming and tricky, but children learn more helpful lessons when we are honest about the challenges we face in life than when we try to conceal them. What is it like to be a teacher with dyslexia? I have been staring at that question for 20 minutes now, and, despite being a teacher with dyslexia, I'm not sure I know the answer." Not all bullying is equal, according to a new study, with the old-fashioned, real-life variety more damaging than the cyber kind. A combination of both, however, could be the real danger to kids. Researchers from the University of New Hampshire analyzed interviews with 791 people (ages 10 to 20) who had taken part in a previous harassment survey. They looked at three types of bullying: face-to-face, technology only and a mix of the two. The nation’s largest school district says it will install door alarms at nearly every one of its schools in an effort to help protect students with disabilities who are at risk of wandering. The New York City Department of Education said that 97 percent of its schools have requested the alarms, which will be installed by the end of 2015. Some schools already had alarms in place or are located inside buildings with security, officials said. In total, the district plans to spend $5.55 million to put more than 21,000 devices in over 1,200 school buildings. Early education providers can be a good option for detecting autism spectrum disorder in minority children, a population that has been traditionally been underserved by early-intervention programs, according to a recent study. The researchers, based in New Jersey, reached out to Head Start programs and other state-licensed providers in low-income, high-minority cities in the state. The child care workers screened 90 percent of the children whose parents gave permission for them to participate; most of the children were black or Hispanic and between ages 3 and 5. When D.C. Schools Chancellor Kaya Henderson came to the District in 2007, there was no office for gifted education and no plan for serving the city’s most talented learners. The school system was overwhelmed with working to raise basic skills for the large number of struggling students. The lack of stimulating District classrooms sent many parents looking for gifted or advanced programs in the suburbs, led them to move their children to charter schools or private schools, or prompted long commutes to schools in the city’s wealthiest Zip codes.